Play Joker's Jewels Slot and Win 500 Free Spins! Joker's Jewels is a online slot by Pragmatic Play with a 96.5% RTP. This high volatility game features 5 pay lines and the potential for epic wins. While Joker’s Jewels online slot is full of fun and playfulness, the many chances to win real money is no trick or joke when you spin the cheerful reels. 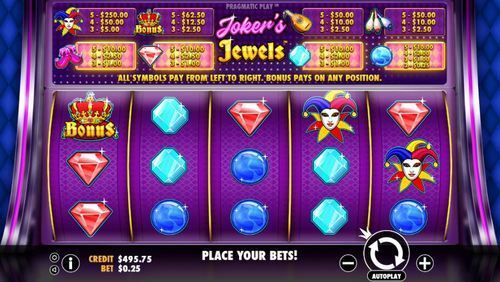 Joker’s Jewels slot game creates the immediate feeling that you have stepped into a magical fun-fare. The classic retro style slots are set against a nicely coloured purple patterned background. High to medium value symbols include the Joker, a Mandolin, and 3 juggling pins. There is also a crown Bonus symbol. Of lower value are the Joker’s pointy shoes, a red diamond, a blue gem, and a sparkling blue crystal ball. Joker’s Jewels really wake you up with very bright and colourful illustrations that light-up and jingle upon wins. The cheerful background music has a playful quality and speeds up with each spin of the reels. So practice your one handed juggling because with your other hand you can spin the bright reels of Joker’s Jewels online at Rose Slots with many opportunities for exciting payouts. Joker’s Jewels online slot has a playful, simple, and retro style gameplay. With 5 reels, 3 wager rows, and 5 paylines, you may soon be dancing to the Joker’s happy tune. While there is no Wild symbol, 5 of the Joker on the reels represents the highest payout of an amazing 50,000 coins on your initial bet. Joker’s Jewels slot has a relatively modest betting range from 5p to £25 per spin, allowing you to enjoy a simple yet exciting gameplay. If you need to practice your Mandolin playing, set the AutoPlay for 10 to 100 continuous spins. There is also a convenient fast stop option to speed up spins by pressing the spin button again. While at the medieval fair, you can even play Joker’s Jewels online as it is fully compatible as a mobile slot as well as on tablet and desktop. With symbols of high value and a Bonus symbol that pays all ways, the theoretical RTP is 96.5%. Joker’s Jewels may make you laugh and dance, but the many chances for wins are no joke. 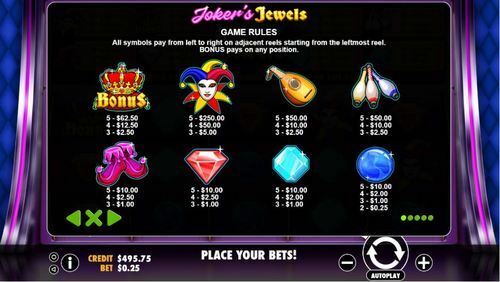 While Joker’s Jewels online slot does not have a Bonus in terms of Free Spins or pick and choose, there is a Bonus symbol that pays out wherever it appears on the reels. This means that 3 Bonus symbols anywhere, whether or not they are side-by-side, is guaranteed a win. At maximum betting for all lines, 5 crown Bonus symbols on the reels will award 12,500 coins. With a payout like that you may feel as if you’ve been promoted from Joker to King. Pragmatic Play brings you this circus-influenced online slot, which has been developed in the classical style and belongs to the ‘traditional' genre of games. The play takes place on a 5x3 layout of reels and rows, with five fixed paying lines, RTP at 96.50% and a big jackpot of 1000 times your stake. Technology now makes it possible for developers to create slot games that would have been unimaginable even ten years ago. Digital animation, combined with internet speed, is moving us closer and closer to the point where all the latest online slots will be truly interactive, cinematic experiences. Although that’s exciting to think about, it does sometimes feel like we forget about what drew us to slot games in the first place; the good, honest fun of a plain and simple game. We’ll always have time for a traditional slot game done well, and that’s what Pragmatic Play are giving us in Joker’s Jewels. It may have been released in 2018, but in its heart, it belongs to yesteryear. Joker's Jewels has been designed and explicitly illustrated so it that it looks like you're standing in front of an old fashioned, traditional slot machine. The frames around the reel have been curved slightly to give you a sense of perspective. Just at the edges of the screen, the hard sides of the ‘cabinet' are visible. Look above the reels, and you'll find the logo of Joker's Jewels displayed in a brash neon font, as if it were written in shining LED lights. That part of the display actually has two purposes; it keeps an informational guide to the winning lines in view at all times. It actually helps to be reminded, and that's probably something that online slots could still learn from their physical counterparts. As the intention of this game is to simulate the experience of playing a physical slot machine as closely as possible, there's no elaborate backdrop behind the reels to distract you. All you have is a nice, cool purple shade that doesn't hurt your eyes, doesn't draw your attention, and leaves you free to watch the reels as they spin. One aspect of physical cabinets we wish the game hadn't simulated, though, is the annoying and repetitive music. On the plus side, at least when we're playing online slots, we have the option to switch it off! 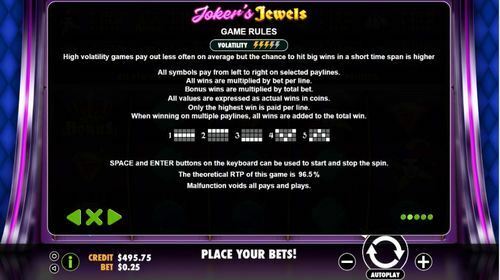 You’d be entitled to expect more than five paying lines in a game that has a 5x3 layout, but Joker’s Jewels honestly doesn’t need any more than that. This is a gentle and relaxed game, and so it doesn’t have many symbols at all. Having fewer symbols means that winning lines appear more frequently, so you’ll encounter the same number of wins as you do on any other slot game with an RTP of 96.50%; it’ll just be the same winning lines over and over again! There are eight symbols which can appear on those lines; a dark blue jewel, a light blue jewel and a red jewel account for the least valuable symbols here. Given that the name of the game is Joker’s Jewels, he could have offered us something a little more lucrative! Never mind though, the joker’s skittles, boots and lute are all worth more, as is the man himself. The joker also has a crown, which is encrusted with jewels and serves as the game’s bonus symbol. Any time you land three or more of them on the reels at the same time, the game will pay out a bonus relative to how many symbols there are, and your stake. Speaking of bonuses, let’s look at the features. Question: If you walked into a bar in the 1980s, found a slot machine in the corner, put some loose change in it and started to play, would you expect that machine to have any interactive bonus rounds, side games or free spins offers? No, of course you wouldn’t. And you shouldn’t expect Joker’s Jewels to offer you any for the same reason. This is a deliberately retro game, appealing to the sense of nostalgia that exists among traditional gamers, and there isn’t a single bonus feature to it anywhere. This might be where we lose some of you from this review, and if that's the case, we understand why. We maintain and curate a wide and varied roster of slot games here at Rose Slots, and if bonuses are what you're looking for, we've got games that are so packed full of them they're bursting out of the seams! Go and root through our selection of games and we promise you'll find something you love. If, on the other hand, you like the sound of what you're hearing, then stay right here and read on. If you do enjoy the pure and simple pleasure of a well done basic slot, then we think Joker's Jewels might be perfect for you. We suppose, if you really stretched the definition, you could count the appearance of the bonus symbols as a bonus of sorts, but as it doesn’t enable any features or trigger any additional modes, we don’t really think we should. That’s not to say the game isn’t generous though; if you’re able to create a winning line made of five joker symbols, it will pay out 1000 times your stake. It was 2007 when Pragmatic Play formed, and they’ve been one of the most productive slot game developers around ever since. Once you’ve played one Pragmatic Play slot, you’ll immediately recognise their style when you play another one; they go for a similar visual style every time, which forms part of their brand identity. There’s rarely a month that goes by without the developer releasing at least one new online slot, which explains why there are currently over 100 of them in existence. That includes some of the most beloved and popular slot games available today, such as Wolf Gold and Gold Rush. Many of Pragmatic Play’s games are available to players here at roseslots.com. Pragmatic Play does more than just make online slots, although that's the primary focus of their operations. You'll also see their name attached to other casino games, including roulette, as well as digital scratchcards and bingo. With one eye on industry trends, their current method of developing slots is to start by making a mobile slot, testing it until they're happy, and then converting it into an online slot. Most developers work the other way round, and it will be interesting to see If this gives them an advantage in the future. If you read their website, you’ll see that they have a company philosophy, which is ‘innovation and dedication’. That means they try to display a flair for the unusual and also push themselves to maintain a steady volume of output. Over the course of the past couple of years, they’ve released a minimum of two new online slots every month. Joker’s Jewels has its own page on Pragmatic Play’s website, and on it, the developer says:- "Joker's Jewels™ is a 3 x 5, 5 lines mechanical slot with a very strong pay table for amazing big wins!" Pragmatic Play never says a lot about their own games, but that's a brief and to-the-point comment even by their own standards. On the other hand, a very simple game only needs a very simple explanation, so why say more if you don't need to? As a developer, Pragmatic Play doesn't really ‘do' sequels; they're more interested in releasing a game and then moving on to another title and another topic. They don't seem to revisit old ground very often. Joker's Jewels is a relatively new game, having been launched in 2018, we wouldn't hold our breath about seeing a sequel any time soon, if ever. They do cater to the traditional games market on a fairly regular basis though, and although keeping games simple is the entire point of making a traditional game, they have offered a couple of variations on the theme. Magic Crystals: Magic Crystals does have every bit of the simple visual appearance that exists within Joker's Jewels, but that's about as deep as the comparison goes. Magic Crystals is actually a deceptively complex slot game. It lures you into thinking you're playing something basic, with stripped-back aesthetics and only nine symbols on the reels, but there are 243 paying lines in the game, backed up by a free spins bonus feature of the kind that definitely wouldn't exist in a real traditional game. RTP in Magic Crystals is 96.35%, and the game sits in the ‘old meets new' bracket; with modern features clashing against a retro look. 888 Gold: If the slightly more modern take applied to Magic Crystals doesn't appeal to you, then we think that one look at 888 Gold might leave you saying ‘this is more like it'. Much like Joker's Jewels, Pragmatic Play has made a big effort to make this game look, feel and play like a retro physical slot machine. If anything, this game is even more simple than Joker's Jewels is; the layout is shrunk down to 3x3, there are no bonus features, and the 8s are wild. Given that even Joker's Jewels has bonus symbols, we can allow the game one bit of flair, and the wilds are it. The RTP in this game is also at the higher end of the market, coming in at 97.52%. We'd go so far as to say that 888 Gold is a traditionalist's delight! Diamond Strike: Despite being a classically themed game, Diamond Strike is one of the best-known slot games that Pragmatic Play has created. You have to go a long way to get noticed with a traditional slot game in the current market, so that alone should tell you a lot about how good this game really is. It won't please every traditionalist though. Although the design of the game is based on retro slots, and everything is beautifully rendered, beyond the classic jewels and fruit on the reels the game is hiding both a jackpot bonus round and a free spins round. It's simple, elegant and beautiful, but if you can't forgive it for breaking with the traditional theme and including bonuses, we understand! If we really went down a list of games that are similar to Joker’s Jewels, we’d all be here for a very long time. If we went back in time a couple of decades, every single slot game we encountered would be similar to Joker’s Jewels! So instead of doing that, let’s look at the other games in the roseslots.com collection that may appeal to you if you enjoy this game. 40 Joker Staxx: Playson have a reputation for doing traditional games to a standard of excellence, and they have several such games available, as you're about to see. 40 Joker Staxx is one of the newer ones; a 2018 release that actually came out fairly close to Joker's Jewels. There is, as the name implies, a joker character in the game. He stacks on the reels (which is also sort of implied by the name), but aside from that, there are no bonuses and comparatively few symbols on the reels. Forty paying lines is a generous offering, backed up by 96.42% RTP. Fruits and Jokers: Playson strike again with Fruits and Jokers online slot, which they don’t class as a prequel to 40 Joker Staxx, but this game definitely lent some of its style and function to the newer release. It’s not quite so traditional though; the game has a 5x4 layout of rows and reels, 40 fixed paying lines, stacking wilds and scatter symbols. This game, with an RTP of 96.51%, is completely vintage in the way it looks, but a little less so in the way that it plays. Joker Expand: Not only do Playson make a lot of games that take inspiration from the classics, but they also make a lot of games that feature jokers in the lead role! It feels like there's a connection running through all three of the Playson games we've mentioned; although Playson has an unmistakable visual style that makes all of their games easily identifiable, this trio looks even more alike than normal. As with the games above, Joker Expand has 40 fixed paying lines, a restricted number of symbols on the reels, and even a comparable RTP at 96.5%, but the presence of a wild symbol that expands and fills any reel it lands on does shatter the old-school atmosphere a little. Joker Gems: In theme, this online slot by Elk Studios is very close to Joker’s Jewels. How could it not be? It’s about jokers and precious stones! There’s a couple of visual themes the two games share as well, but the mechanics of the two games couldn’t possibly be more different. In fact, Joker Gems is different to almost any other slot game out there. It’s like a slot game crossed with Tetris, where wins are formed by creating clusters of gems. It takes a while to get your head around it, and it’s a long way away from anything traditional, but it’s a fun an rewarding game with an RTP of 96.3%. When you make a point of saying ‘we make our slot games especially for mobile devices’, as Pragmatic Play have, you run the risk of making a rod for your own back. Anything less than a perfect copy of the original slot from one device to the other would be seen as a disappointment in that context, and so we expected perfection when we gave Jokers Jewels a try as a mobile slot. They didn’t let us down. There is no difference whatsoever between playing Jokers Jewels on a computer and playing Jokers Jewels on a smartphone, apart from the lack of keyboard and mouse on your phone! The animations are every bit as smooth, the sounds haven’t suffered at all, and there has been no downturn in the quality of the graphics. The intelligent way Pragmatic Play have programmed the slot game mean that it functions perfectly no matter whether you’re holding your device upright or on its side; the display will rearrange itself, and reposition the buttons and reels accordingly, optimising the way the space is used either way. Pragmatic Play program mobile slots so well that they almost make it seem easy; it's only our experiences with other developers that tell us it is not. Right now, they represent the industry standard when it comes to ensuring their slots are playable either at home or on the move. If you’ve had a great time playing Jokers Jewels on your laptop or desktop, you’ll have just as much fun when you load it up on your smartphone. There are upsides and downsides to releasing traditionally-themed games for slot developers. On the upside, you know that so long as players know where to find your games, there will always be a market for them. Traditional games are among the most accessible, and they’re easy for people to jump on and off when they just want to play a quick game without getting involved in anything complex. The downside is that traditional games just don't fire the imagination of the industry press like a flashy, modern slot would. Everyone in the media is waiting for the next innovation or the next big thing, and they're less likely to hand over space for reviews or features to a market they consider to be old and already well-served. Despite the fact that most of the gaming media allowed the game to pass them by, Jokers Jewels still seems to be winning support from people. CasinoAus, an Australian website which reports on the latest developments within the online casino scene in that part of the world, covered the release of Great Rhino by Pragmatic Play in 2018. The article is mostly about that game, and is full of excitement, but as the author discusses Pragmatic Play's history, Joker's Jewels gets referenced as an example of the quality output the developer is known for. If this little traditional game can get noticed ahead of some of the developer's better-known games, it's doing well for itself! If you've read this entire review, you must love traditional games. We lost all the feature-hunters a long time ago when we said this game doesn't have any bonuses! If you really are a fan of the classical format, this might be one of the best games of its type you'll play in a long time. It's not just a traditional game; it's almost a simulator that takes you back in time to a point where games like Joker's Jewels were new. If you'd like to take a trip down memory lane, we'd love you to take it with us on roseslots.com. Our whole catalogue of over six hundred online slots is here and waiting for you to explore it. Whatever kind of slot you’re in the mood for, we’ll have at least one (and probably many more!) slot games for you to try out. We reward regular players with free spins every time they deposit £20 or more into their account, and if you’re new to us, you could receive as many as 500 free spins just for registering for an account today! Not only that, we run weekly cashback incentives, meaning that players who stay and play with us always stand the chance of winning a little extra. It's our way of saying thank you for your business. Register today, find your new favourite online slot and start playing. Rose Slots is yours to enjoy!